Organically Grown recently added Organic Toddler Clothing to their collection and were kind enough to send me an outfit from their collection to review. The collection is comprised of adorable two-piece outfits for boys and girls in sizes 12-24 months, and 2T-4T. Each outfit features a cute and eco friendly slogan on the t-shirt. The outfit that I received has a soft, pastel yellow shirt with a pink quilted butterfly applique that says "Pretty Natural". The shirt is tag free, which I really like because tags in shirts frequently irritate my daughter's neck. The matching shorts are a pink the color of the butterfly applique and feature an elastic waist. The quality of construction appears to be very nice. My daughter loves the outfit - I will say, she is a typical girl and loves to get new clothes. She also loves mail, so to have a new outfit arrive by mail, made it a special treat for her. She likes the butterfly and can't wait for shorts weather so that she can wear it. In addition to their new toddler collection, they also have an Infant Collection! 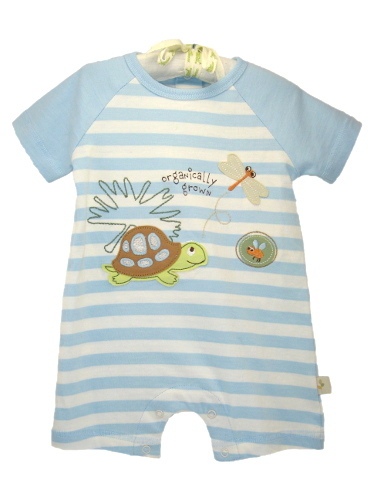 According to Organically Grown, some of their best sellers include three-piece sets with baby gowns, body suits, jackets, pants, blankets and hats, all on padded hangers and priced between $12-38. Why organic, you ask? Organically Grown's perspective on this question is: "As the awareness of the effect that pesticides and toxins have on the environment and individual health grows, more and more families are realizing the importance of choosing organic products. Making this choice is not only good for our earth; it is good for all of us. With your help, organic textile production will increase, becoming more of a standard in the clothing industry." Organic cotton has all the high quality, soft and cuddly texture of cotton with none of the harsh chemicals to irritate your child’s skin. "With products by ORGANICALLY GROWN, there is no need to compromise between your budget and your conscience. As well as being ECO-FRIENDLY, our clothes are AFFORDABLE and STYLISH." Be sure to check out their website and store. You can also friend Organically Grown on Facebook. No compensation was received for this post. Organically Grown did provide one outfit for my daughter, so that I could share my experience.